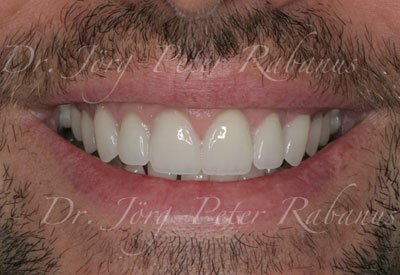 This patient was unhappy with his old veneers. He considered them lifeless and monochromatic. He was looking for teeth with a warmer and more natural color. This is a new trend in cosmetic dentistry: many patients want their old veneers replaced because they are obviously artificial and hence embarrassing. 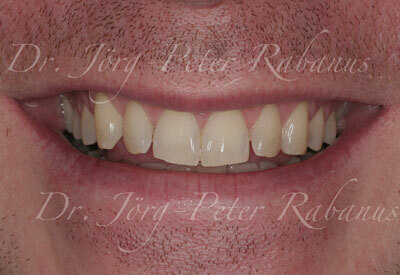 The new porcelain veneers were placed one month later. Their shapes and shading is natural, displaying variations of chroma and incisal translucencies with developmentally correct developmental grooves in the dentin (mammellons) that is visible under the translucent incisal edges of youthful teeth. All these element make a veneer look naturally youthful. The patient felt much more comfortable with his new smile. The following patient had come to a point in his life where he looked for greater professional challenges and improvements in his personal life. He had thought about addressing the timid and dull look of his teeth for many years. He was very excited to move forward. 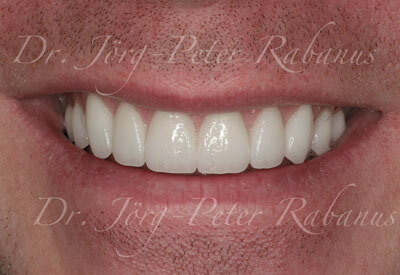 However, he wanted his new teeth to look dominant, naturally youthful, and not too white/opaque. 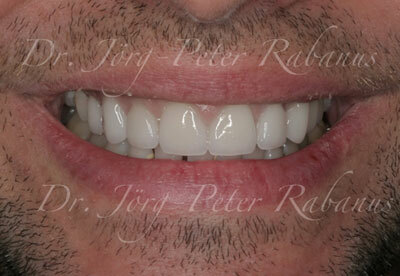 The patient's natural teeth have many aesthetic shortcomings. They were yellow and their size did not allow a harmonious alignment of the dental arch. The most challenging aspect of this case are the severe signs of wear at the incisal adges. Conditions like this cannot simply be restored by placing porcelain veneers. A meticulous analysis of the bite relationship and the patient's chewing patterns are indispensible for the design of porcelain veneers that are in a functionally sound relationship with all other oral structures. You can read more about this at Extreme Makeovers. The new porcelain veneers were designed according to oral function. After relaxation of his chewing muscles with a deprogrammer, the "home position" of his lower jaw was determined and recorded. An analysis of the relationship between upper and lower teeth at the home position revealed that his bite needed to be equilibrated. Once performed, his masticatory system was calmer and more relaxed, improving the prognosis and longevity of his future porcelain veneers. In addition, the veneers obtained funcitonal surfaces that were in absolute harmony with the function of the remaining teeth. All elements of naturally youthful teeth were incorporated: polychromaticity, rounded incisal line angles, progressively increasing incisal embrasures, Halo effects, incisal translucencies with visibility of dentinal mammellons, and much more.